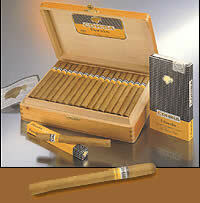 We offer authentic cuban Panetelas Bn cigars. First of all, this is a Cohiba. It doesn't have the advantage of large shapes, but this made of this Havana the ideal cigars for short breaks. These cigars are ideal while travelling, when you are waiting for boarding, you have only 10 or 15 minutes, instead of lighting up a great shape, take a Cohiba Panetela. Varnished wooden boxes, containing 25 Havanas.